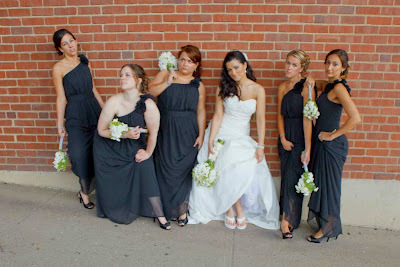 Today's real weddings feature black bridesmaid dresses. Black is not only versatile for any season, it's a downright flattering and classic color to wear! Nicole and Eric had a late May wedding in Cleveland with a reception at Progressive Field, home of the Cleveland Indians. 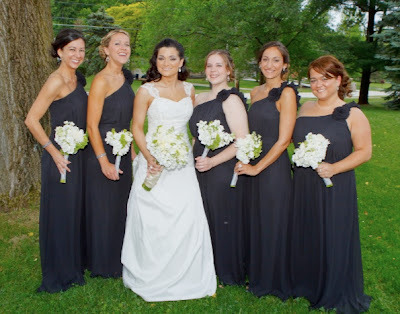 Nicole's bridesmaids wore After Six Style 6611. The pop of bright green in their white bouquets complemented the crisp grass and leaves of springtime. Having some fun re-enacting the "Bridesmaids" movie poster! 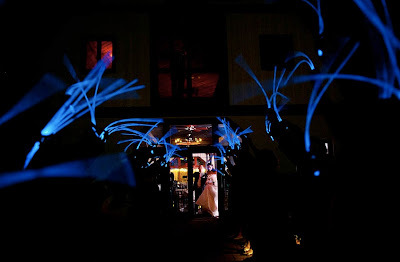 Nicole and Eric went all out on DIY, from making their own centerpieces to invitations to the veil. Eric even prepared all the food himself since he is a chef! 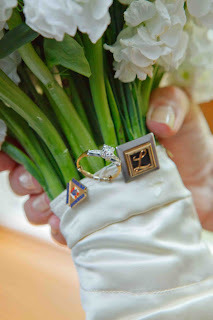 Nicole and her sister made the bouquets, wrapping the bride's bouquet with fabric from their grandmother's old blouse. 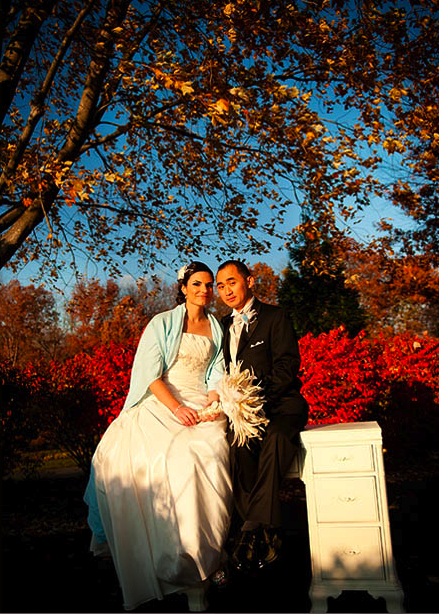 Stephanie and Hoang had a fall wedding at Sunset Crest Manor in Chantilly, Virginia. 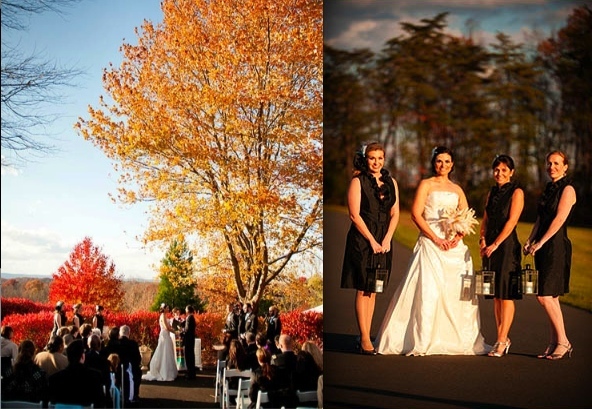 They took full advantage of the bursting foliage, which provided a dramatic backdrop for their ceremony and bridal party photos. Stephanie's bridesmaids wore Alfred Sung Style D465. Hoang also wore a Dessy satin cravat and vest in Oyster. 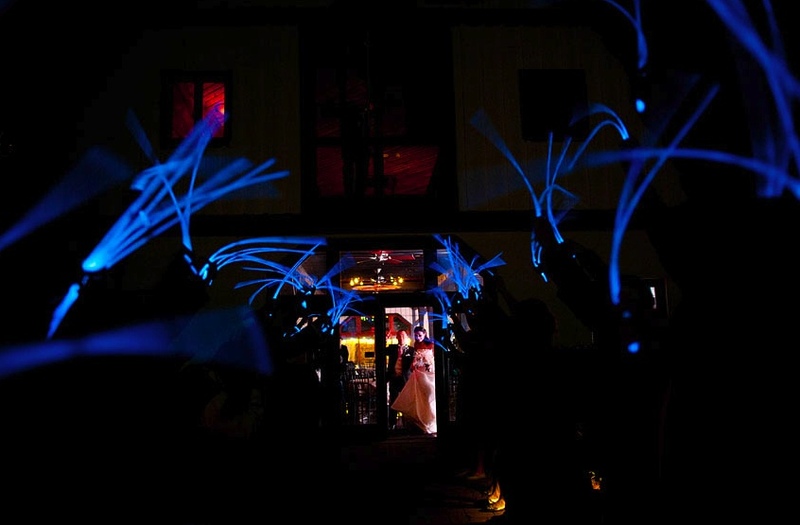 When the evening ended, the guests sent them off with glowsticks! Congratulations to our beautiful couples. 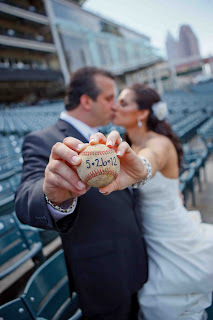 We hope you are enjoying married life!